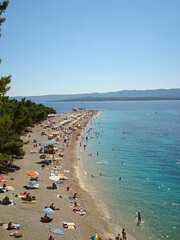 After picking up a few things in Supetar, we arrived in Bol and headed for the famous Zlatni Rat beach. It felt really good to stretch out on the white sand and swim in the warm Mediteranian water. After enjoying the beach for the morning, we wandered in to Bol and had lunch at a sidewalk cafe. After that, we set out to explore the town and the nearby Dominican Monastary. After spending the day at Bol, we returned to Milna for dinner followed by ice cream at the Caffe Bar Conte. We had hoped to take the ferry from Split to Dubrovnik but we were unsure of schedules so we opted for an early start. 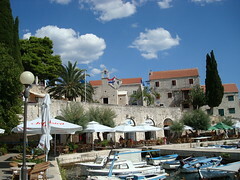 We had another wonderful breakfast on the patio, packed and headed for Supetar where returned our rental car. We took the ferry back to Split and stopped in at the Jadrolinija ferry office. They confirmed that the ferry to Dubrovnik only ran twice a week and did not run that day. We had thought that our marathon bus ride from Plitvice Lakes to Split had been our last Croatian bus ride, but it looked like we were in for one more. 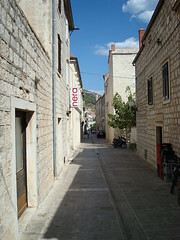 We headed across the street to the bus station, purchased two tickets to Dubrovnik, and were soon on our way. The trip took us along the coast, through Bosnia for a short stretch, and on in to Dubrovnik. We transfered to a city bus and were soon at our hotel.